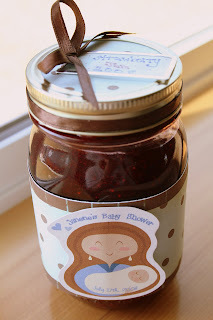 My crafts are centered around the baby shower I am throwing this week. 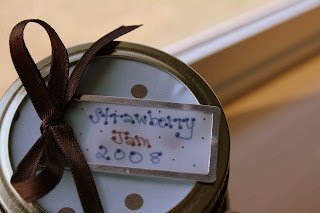 For one of the prizes I am giving away a homemade jar of Strawberry Jam. So I decided to decorate it with the theme of the shower (brown and blue). 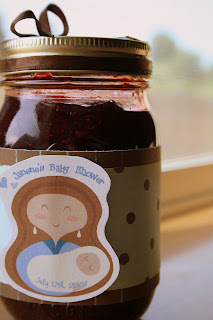 I used scrapbook paper on the top and around the base and printed out a cute clipart picture of a mommy and baby (edited to my colors) and added wording and the date of the shower. I put some ribbon around the top ring and added a descriptive tag on top with a ribbon bow.